Another juicy tidbit I came across on the NK official news service Naenara is that they can build apartments in 4.9 minutes! "The President said housing came first in the development of Pyongyang and proposed the introduction of the prefabricated construction method, a new technology in those days. 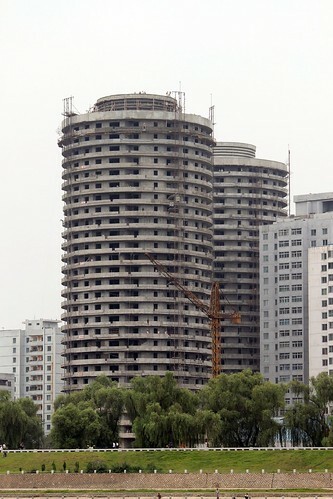 Thanks to the new method, the builders assembled a flat within 14 minutes, thus building 20 000 flats in a year. And this is how “Pyongyang speed” came into being. ......As in the construction of Munsu Street that took less than three years and Kwangbok Street a little over two years the builders set up a flat in 4.9 minutes, usually more than 200 a day in the construction of Thongil Street in the early 1990s. It was a building speed beyond comparison with the previous years." From the looks of some of the NK apartments I've seen pictures of, I can believe it. Isn't North Korea in an earthquake zone? I don't want to live in a building made in 5 minutes if its in an eartquake zone. I don't know that they're in an earthquake zone, but close enough to worry. I wonder how that giant Ryugyong Hotel would hold up in a shaking? On that thought, if they can build apartments in 5 minutes, why has it taken 23 years and counting to build the Ryugyong? I wonder what the 4.9 minute flat looks like? It must be a very minimal design. My guess is that the components of the flat were built elsewhere, not counted as assembly time, and the assembly on site in 4.9 minutes is what they mean. Kim Jong-Il once built an entire 3 bedroom house by himself in a then-record time of 9.5 minutes. He has since broken his own record, taking only 8.7 minutes to build an inhabitable 80 foot statue of the Great Leader Kim Il-Sung, complete with recreation room and 2 car garage. Maybe they're using creative math - if they had many building projects around the country at the same time, they could average it out. No, I pretty much believe they mean exactly what they say - that they can build one in 5 minutes. And I believe that as much as when they say that Kim Jong-Il was born on a sacred mountian top amid double rainbows and a bright new star in the sky appeared. Thats what I thought too, that they are in that 'rim of fire' zone so there must be earthquakes. They are typical slab construction. Many of the rural buildings I have seen have NO re-bar. I have watched locally fired bricks being made and fired. These bricks are mortared together to construct walls as high as three stories. Some sites I have been to in the cities have re-bar (these do) but I can only imagine what an earthquake in the north would do. Some of the old buildings are awful. Think about the Szechuan earthquake in 2008. Here there is no heavy equipment to speak of. A few cranes are seen here and there but the devastation would be severe. You're a spammer whose spam link is now deleted and you've been banned.